The Wilson Staff Hybrix carry bag is a new addition to the golf bag category. 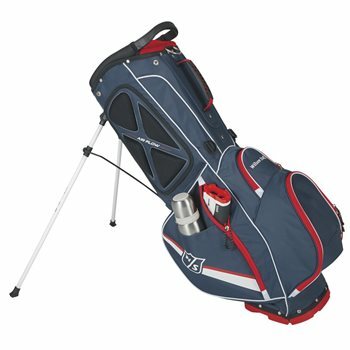 The bag features a unique base that works well when attaching the bag to a push cart and a quick action stand that works well when carrying the bag. The Staff Hybrix also features a 14-way top that includes full-length dividers for organizing and protecting you clubs. The top also includes an integrated handle for easy lifting and putter wells for oversized grips. The bag is designed with a double padded strap and soft mesh hip padding to provide comfort when carrying. It is also designed with 6 pockets, which includes 2 large accessory pockets, 1 full length apparel pocket, 1 valuables pocket, 1 ball and tee pocket and 1 open pocket for easy accessibility. 14-way top with integrated handle / top dimensions: 10" x 8.5"